We tent camped overnight at Tuckahoe State Park but the weather was so oppressive that enjoying the nearby Adkins Arboretum and trails was challenging. We did enjoy our time together anyway, particularly the kids who were able to interact with a turtle, toad, and insects. Our island tour was better than expected since we were moved along the island in a cool bus with frequent stops and tour guides to explain the island's history. Since being settled in 1626 the island has been used as a plantation, farm and fishing village, British campsite in 1812, black cat fur ranch, and as a resort for wealthy democratic politicians including FDR. After nearly disappearing from erosion, the island is being recreated as a zone of natural habitat using sludge dredged from the shipping lands of the Bay. 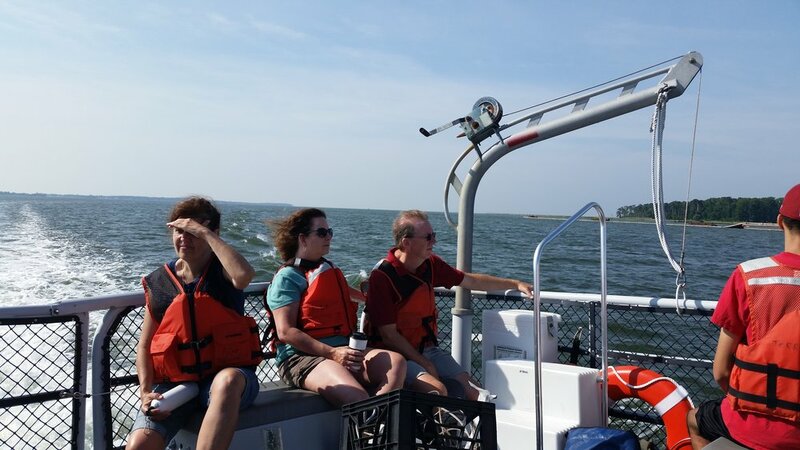 Since its reconstruction with dredged material began in 1998, Poplar Island has grown from about 4 acres to more than 1,200 acres with a total of about 1,700 acres expected. Half of the island's acreage will be wetlands and half wooded uplands. According to wikipedia, the project will use 68 million cubic yards of dredged material protected by 35,000 feet of containment dikes, built with 75% federal funding and 25% state funding. 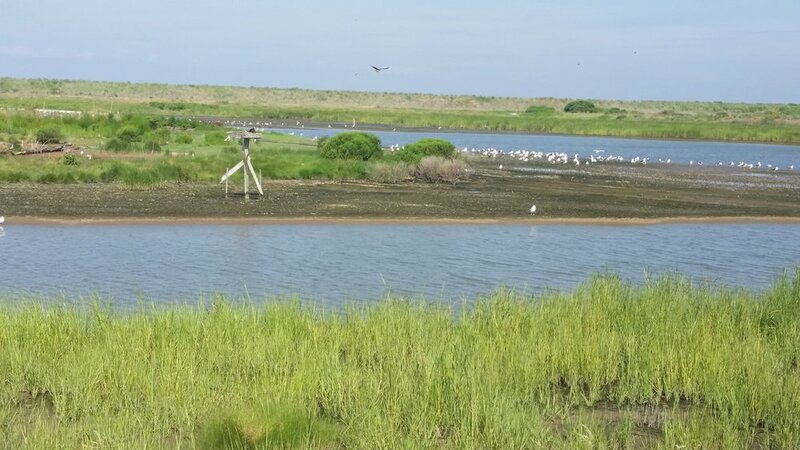 Only "clean" material, dredged from approach channels, is being used on Poplar Island. The Poplar Island restoration project will not use material dredged from close to Baltimore, which may be contaminated with heavy metals. The island is the home of approximately 175 different species of birds, including terns and osprey. More than 1,000 diamondback terrapins have been reported hatching annually on the island in recent years. Besides giving public tours, other efforts are made to connect people with this project. 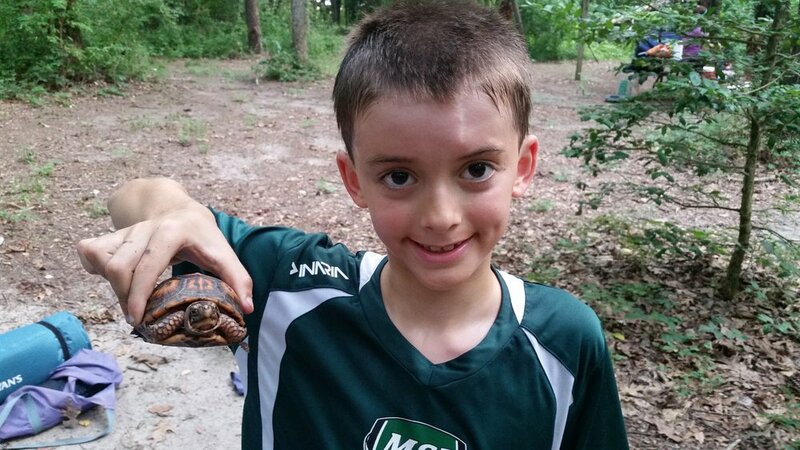 Local schools can take one of the young terrapins to raise for later release to the Bay. Boy and Girl Scout troops have made and installed blue bird and other bird boxes on the island. Volunteers are also needed for certain planting projects. Thanks to Megan DiFatta who set up our tour and was one of our guides. To schedule a tour contact Megan at mdifa@menv.com or call 410.770.6503 (office). 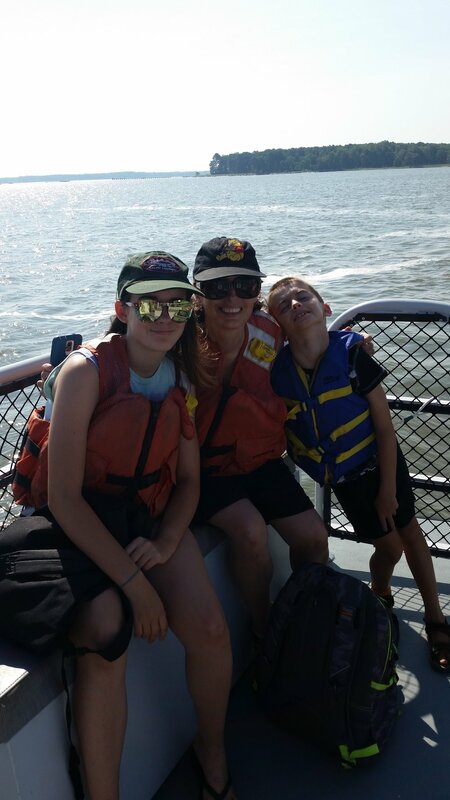 Click on photo below to see slide show of camping at Tuckahoe State Park and tour of Poplar Island.